needless to say the kids and i were housebound most of the time and we had a jolly good 'ol time trying not to want to rip each other's faces off by the end of the "vacation". happy to say they are now back in school. and i'm just so grateful that summer vacations are nothing like spring vacations, and we get to go to some kind of water facility every day so we can be happy tired people by the end of the day. and no one wants to scratch anyone else's eyes out by the end of it. :) yes i can't wait till summer! 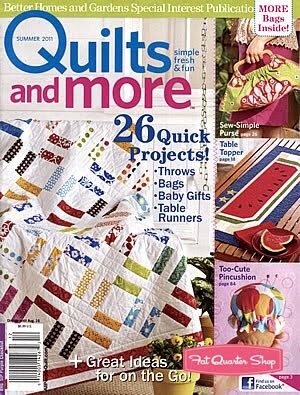 i have a simple quilt in this summer's edition of Quilts and More magazine. paired with some doilies, and monochromatic fabrics i think this would be fabulous for the new mom, and baby to be. 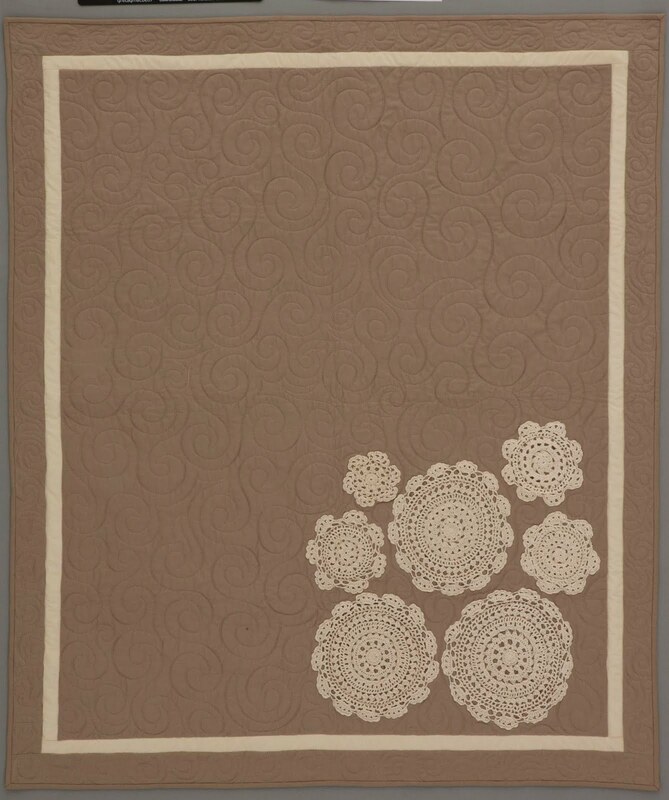 i think simple elegance when i look at this quilt. and the cream is bella solids as well. the cream doilies were found either at micheal's or walmart, but how fun would it be if you had time to go to second hand stores to check out their selection? 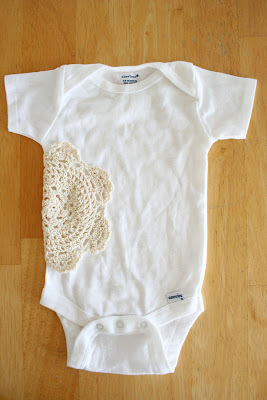 then pair it up with an adorable little onesie embellished with a doily as well to seal the deal. That quilt is simply gorgeous! I love how classic it looks with that beautiful quilting! I am just curious how you attach the doily to either the fabric for the quilt, or the onesie. 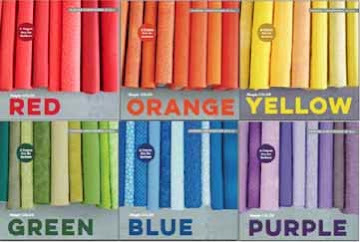 We went to place an order for the Moda book in your shop and it showed that they are sold out. Do you have plans of restocking? Congratulations on your publication!!! It is a beautiful quilt that would be great for anything. I hear you on "spring break". My big man had a 4 day weekend they called spring break. Although I love my big man, I am glad he is back at school today. Wait...just two weeks till market, right? I look forward to meeting you! Perfectly timeless. I wish Felicia lived by me! Great idea! How did you attach the doilies? That quilt is beautiful! I just love it! wow. I love that quilt!! so simple and so beautiful. Congrats on the publish! That's a beautiful quilt. Good luck getting ready for market. I LOVE the quilt!! The colors are really nice! LOL....thank you for letting me stop by...heehee do I remember those days...ahhhh rainy vaCATIONS... MAKES YOU WANT to move and not tell anyone.... Glad you all survived. and the onsie... How cute...fantastic idea, thank you. What a terrific idea - thanks so much for sharing it, and for the heads up on the new issue! Such a beautiful, soft quilt. Who knew taupe could look so ... girly? 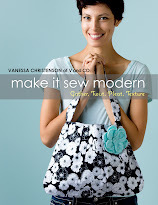 I especially like how the top-stitching design give an overall twirling effect. Hope I get to meet you at Market! beautiful quilt...and I do agree with you on the simple elegance. I find I am getting more into that style myself these days. Love the quilt, you are so clever. Very elegant. Good on you! The quilt came out so pretty and elegant. Good luck with the show, packing is such a pain. So glad to hear you survived spring break. you can applique the doily's on. that's what i did. Beautiful! Wish I'd seen this before the babe was born...not a chance I'll have time now! Glad to hear someone else's "spring break" was so lovely....add in a cancelled trip to grandma's, some fevers and a little vomit and you've got our "break". Love the "rip each other's faces off" part...so true! I have a box full of doilies from my husband's grandmother and was looking for the perfect way to encorporate them. I love them on a quilt great idea! I was waiting in line at the check out at JoAnn Fabrics flipping through this magazine and I saw the quilt and fell in LOVE! My Nana made tons and tons and TONS of doilies... and when she passed away, we were left with a whole bunch. I didn't pick up the magazine at the store and I didn't remember what magazine I had seen it in, so I googled "doily quilt"... when I finally came across the image of the quilt I was SO excited! Thank you for such a wonderful idea! I'm so excited to incorporate her work into mine! LOVE your quilt. Congrats on being published in that magazine! What an elegant quilt. It's so classic. I actually have some doilies from my grandma that I've saved and this is perfect for them.